June 28th 2017, Slidebar, Fullerton CA: When it comes to a strong metal scene, specially the one that resides in California, one great aspect of it comes from a well diverse and promising local scene. You need it for the downtime between huge shows, support for the mid-level shows, and for the locals themselves to gain word of mouth and have successful shows of their own. 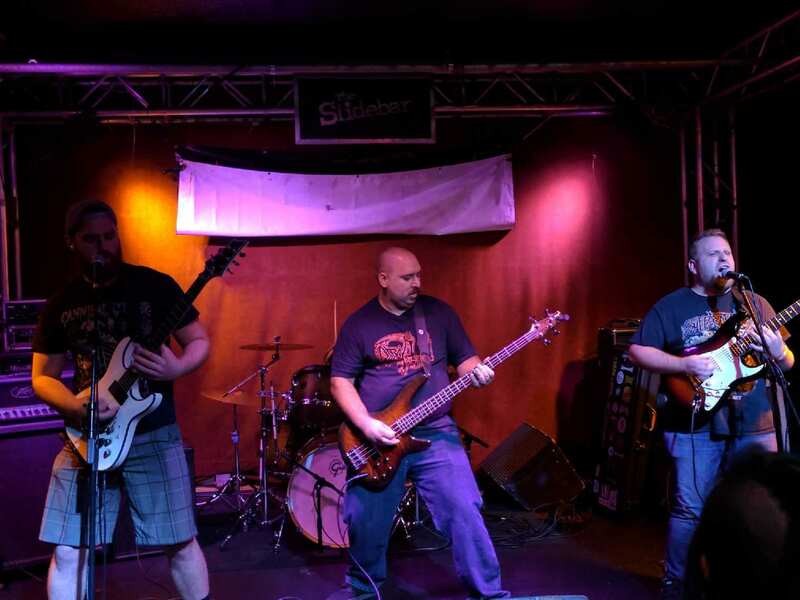 For 10 years and counting, thrash/death metal act Madrost, has been doing just that. 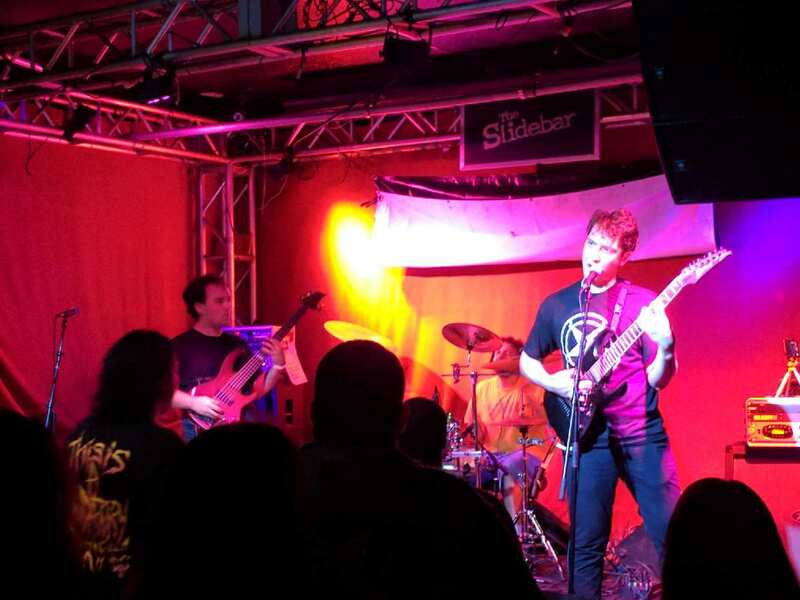 From support roles in larger shows as well as constant local shows of their own, founder/guitarist/vocalist Tanner Poppitt has kept Madrost well respected in the Southern California metal scene. Last Wednesday June 28th they held the record release party for their latest album, ‘The Essence of Time Matches No Flesh’, released only a couple of days prior. Not only was this lineup fairly stacked, it was at the Slidebar in Fullerton, a venue I find to be quite underrated in its setup, location, and various perks given. Even better? It was a free show. Absolutely no reason not to support the bands and Madrost’s newest release. 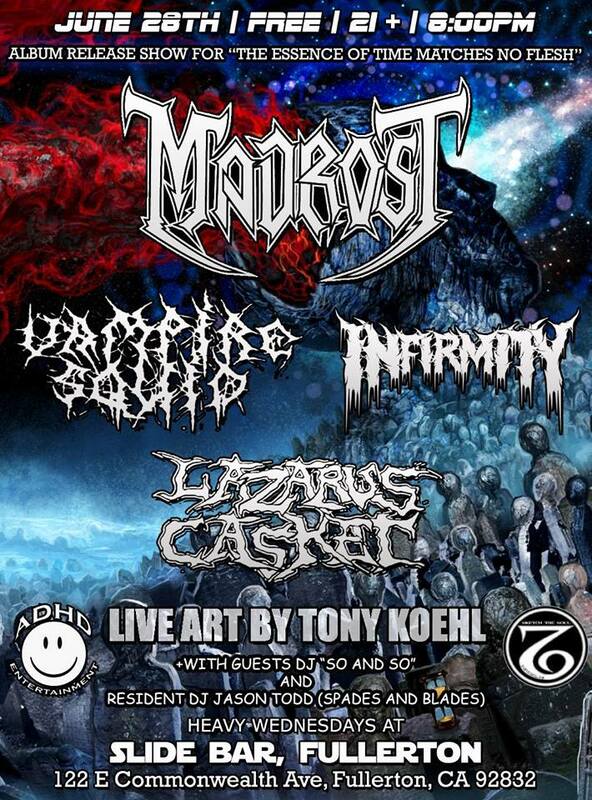 This was expected to be a great local metal night. Doors opened at 8 PM to a fairly sizeable crowd in the bar area, slowly making their way to the music room. Metal right now is in a boom period, and it’s apparent to notice the effects. Even on a Wednesday night, the crowd was engaged in making the time to support the scene. We need to keep this going all throughout. The first act of the night at 9 PM sharp, Lazarus Casket opened the show. Being around since 2008, but having been on a long hiatus, this would be their third show in 3 years. And, knowing Jason Tyler for many years as the promoter and owner of ADHD Entertainment, a fine promotion that has booked shows for several years, including the incredible Vader gig only a few weeks ago, I never got the chance to actually hear his band, or hear him sing as the vocalist of Lazarus Casket. It would be an understatement to say that I waited too long to hear them. I was floored. The band was well rehearsed, in your face with the speedy and heavy riffage, and Jason Tyler certainly has some lungs in him. With screeching highs, quality growling, he happily engaged the crowd. I would say his movement around the stage could have been better, since his frontman skills are stellar. But, three shows in three years, I can understand still getting into a rhythm. ‘Shield Chaser’ was the highlight of their set, with both guitarists Aaron Miller and Bryan Schwarz starting off with this hypnotizing dissonant chord breakdown. The variety in the band was apparent, jumping from your standard melodic death metal string skipping riffs, to these doom like passages that truly stood out, especially in the end of ‘Engraved’. Although Aaron’s guitar volume could have definitely been higher in the mix, it was only a minor occurrence for Lazarus Casket. The crowd loved them, and the energy could be felt by Jason as well, reminding everyone that tonight was about Madrost, humbly exclaiming support for the scene all around. I was quite impressed with Lazarus Casket, and certainly waited too long to finally hear them play. Next on the bill, a familiar band took the stage. 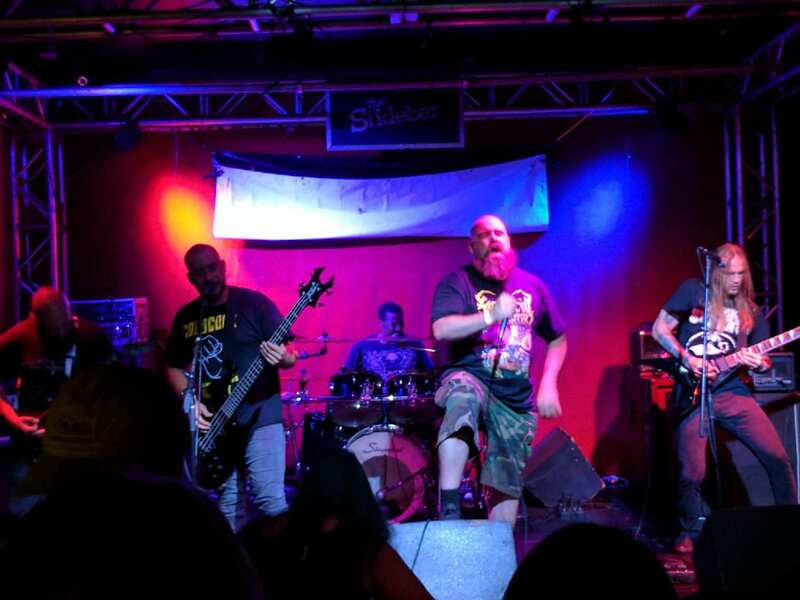 Just recently headlining the side stage of the Vader gig at Malone’s earlier in the month, Infirmity walked out to a loud reception, surely those in attendance were at that same show. Often times, the impact of hearing a new band will have this blurring effect. You remember bits and pieces, with some really standing out, and other moments still taking time to register. Although I truly enjoyed their set at the Vader show, that’s pretty much what took place. For tonight’s performance, it was even better. The darker riffs came back into my memory stronger, with the technical and brutal passages making me nod my head with an even larger smile. They’re certainly solid musicians, but their songwriting and music placement stands out the most for me. Vocalist/guitarist Kevin Lowery no doubt is the leader in this band, in terms of presence, crowd engagement, and the sense of the music all around that he plays. I found his solos to be more of the “emotional” kind, not full of the skill he plays the other riffs, more of just some crazy bends and rapid picking quick ascensions on the fretboard. But the outro to ‘Unholy Deception’, with the beautifully morbid guitar gallop, and actual tasteful start and stop riffing, it was a monster. The same could be said for their title track of their unreleased new record, ‘Descendants of Sodom’, with the music all over the place and extremely chaotic in terms of the tempo and complex chord structures found in the middle of the song. If that is what’s to come for the newest record, I’ll be waiting with baited breath for it. Another fine performance from Infirmity, and hoping they’ll be seen on more strong tours sooner than later. And for the most interesting portion of the night, Vampire Squid were second to last on this “Heavy Wednesday” event. I’ve seen their name on various posters, but never got to see what they were like, and tonight was my chance to do so. Their name not withstanding, they present funny and well written puns, I’m sure you can guess, about ocean themes and the dark crevices of the deep water creatures, potentially asleep in our world. To say the least though, this band is extremely talented. Playing a blistering technical death metal style with some mathcore elements sprinkled in, the guitar playing and unusual vocal work from Andrew Virrueta was apparent and well noticed by the crowd. His demeanor playing the music, as well as jokingly interacted with the crowd between songs, was noted and humorous. But once more, his axe skills were a sight to witness. From sliding, complex chords at a frantic pace, to a professionally constructed death metal riff that slowed the chaos for moments, there was no denying the raw talent he possessed, as well as the bassist Jakob Sprinkle, and especially the jazz-influenced drummer Mark Rivas, who would also play with Madrost. 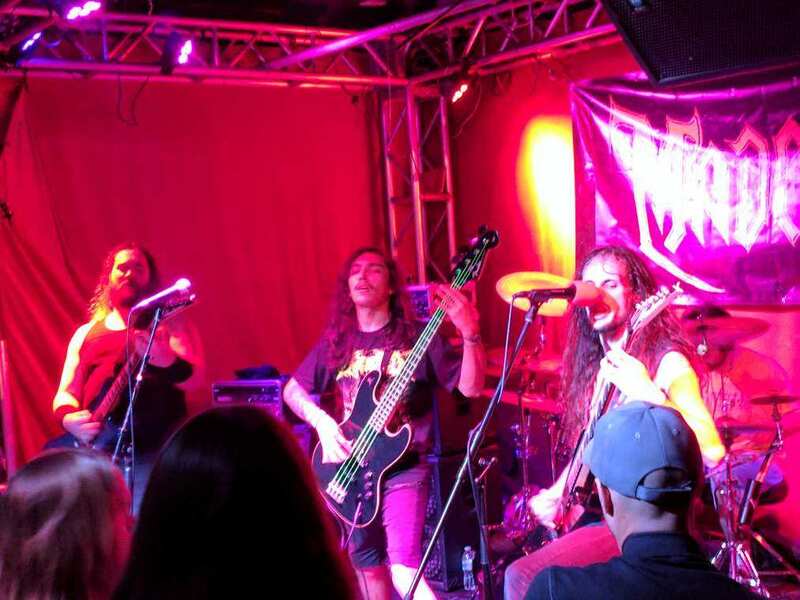 With that being said, there were numerous sound problems that plagued Vampire Squid’s set, including Virrueta’s vocals cutting out at random times. Speaking of their raw talent, the structure of the songs seemed a little random at times, and despite the truly impeccable music being played, it was a little difficult to completely get into Vampire Squid as I wanted. But, seeing the profound musicianship of the band, I know with no doubt that Vampire Squid will continue to get better, and hone in the raw and impressive talent that lies dormant within them. 5. Where is Your Cod Now? And finally at 11:15 PM sharp, with the Slidebar music room filled up nicely, Madrost took the stage and was met with a roaring approval and lots of energetic chants of “Madrost.” They wasted no time, starting off with ‘Scorned’ from their new release ‘The Essence of Time Matches No Flesh’, and immediately starting the first mosh pit of the entire evening. My only time seeing Madrost was 4 years ago when The Absence played, and they played a solid set, but they’ve improved drastically since then. Madrost plays a style of thrash metal that I love and almost require: fast, technical, and dark. Sorry Anthrax, I appreciate you a great deal, and enjoy many songs from your catalogue, but it’s not the thrash I graciously enjoy. The speeds were either neckbreaking, or a tritone like calm to catch your breath, including a deep sea guitar pedal effect with the clean arpeggio picking. It was soothing, and also menacing, something that can be lost when metal bands use clean effects. 5 of the 9 songs played at this show were from the new record, and that included the highlight of the night, a walloping punch in the form of the tracks ‘From Sand to Dust’ and ‘Dimensions’, which when played one after another felt like Parts 1 and 2 of one song. Absolute props to Mark Rivas, who is in Madrost but also plays in Vampire Squid. For the endurance displayed, as well as warp speed blasting with tasteful and ear-oozing cymbal clashes in between, the crowd loved his drumming and roared with approval every chance they got. What I truly enjoyed from this performance, was the no-nonsense approach of Tanner Poppitt, the founder and leader of Madrost. Constantly improving his writing skills and guitar playing, there’s a clear vision within the riffage and his raging vocals, not too gurgling or shrieking, but this comfortable middle that would make Chuck Schuldiner himself proud. He has an eye for what works with rhythm and lead playing, and takes the craft of Madrost and metal quite seriously. No gimmick, no attempts to be “true metal”, but sheer, raw and emotional dedication, and it’s honestly why the crowd was so engaged. Not only that, but there were many friends in the audience, cheering loudly, and banging their heads with full force. I was taken aback by how much support was truly in the room, and reminded me what you can do with your band, and the scene itself, by staying true to yourself, showing honest passion and desire for what you play for. I could’t believe the aura and energy in this room. This is what the metal spirit embodies, and why it means the essence of the world, for all of us. Madrost’s 50-minute performance was fantastic, and Tanner showed his thanks and support, shaking hands with everyone in the front. This was a special, intimate yet sizable crowd for this record release party, and all of the bands, the fans, and Madrost did their part. 10 years strong, and perhaps 10 more years going forward, Madrost continues to make strides on the extreme metal genre, and leaving us eagerly awaiting the next epic performance.